(VEN) - Foreign direct investment (FDI) has had widespread effects on the Vietnamese economy. However, the linkage between the FDI and domestic sectors in value chains is yet to yield desired results. Tightening the linkage between domestic and FDI businesses was a major topic of discussions at the mid-term Vietnam Business Forum (VBF) 2018 that took place recently in Hanoi. Addressing the forum, Minister of Planning and Investment Nguyen Chi Dung said the Vietnamese business community, consisting of domestic and foreign companies, has grown and contributed significantly to the continuous growth of the Vietnamese economy in recent years. So far, 128 countries and territories have invested in Vietnam through about 26,000 projects with total registered capital of more than US$326 billion, of which over US$180 billion has been disbursed. The FDI sector plays an important role in the Vietnamese economy, contributing about 25 percent to total investment in development and 20 percent to Vietnam’s gross domestic product (GDP). About 58 percent of FDI in Vietnam is concentrated in processing and manufacturing industries. The FDI sector creates 50 percent of industrial production value and 72.6 percent of total export value, generating jobs for 3.6 million direct workers and 5-6 million indirect workers. However, Minister Nguyen Chi Dung said that the linkage between FDI and domestic businesses in value chains is yet to yield desired results, and that the development of support industries and technology transfer activities remains limited. Sharing this opinion, Vu Tien Loc, Chairman of the Vietnam Chamber of Commerce and Industry (VCCI) and Co-Chairman of VBF Consortium’s Management Board, said technology transfer by FDI companies to Vietnamese businesses is still limited, and support industries in Vietnam remain underdeveloped. To expand production, large companies, such as Samsung, have to seek support industry products from foreign suppliers. Therefore, tightening the linkage between domestic and FDI businesses has become crucial to Vietnam in its new development period, helping promote sustainable growth of foreign investment and Vietnamese industries. Representing the business community, the chairman of VCCI affirmed the government had issued a decree on support industry development, but the legal framework to promote these industries in Vietnam remains inadequate. “The Vietnamese business environment needs improvements at many points to meet advanced standards in the region. A big gap still exists between domestic small and medium-sized and private companies and those from many other economies in terms of management skills,” Vu Tien Loc said. 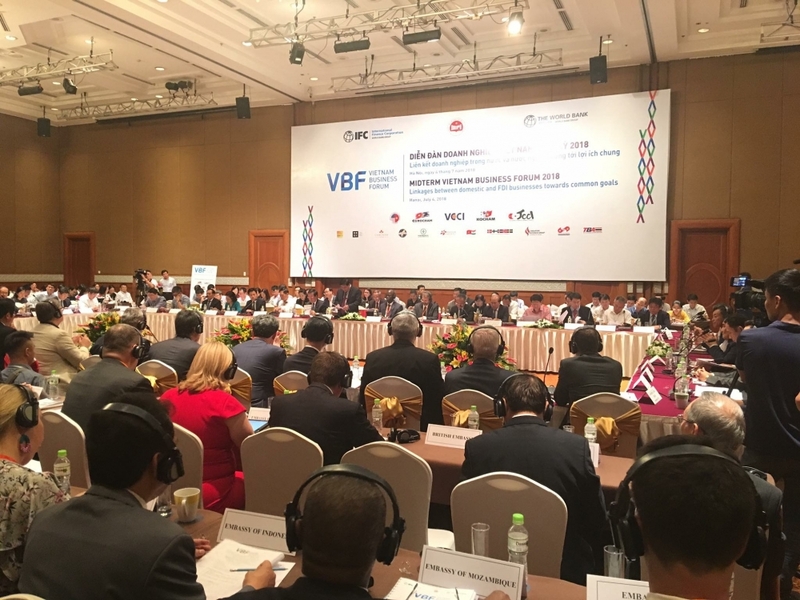 According to the chairman of VCCI, Vietnam needs a master action plan to activate the government’s support policies and the assistance of FDI and multinational companies. In the opinion of Minister Nguyen Chi Dung, FDI companies should take the initiative in creating opportunities for Vietnamese businesses to join value chains. For their part, domestic companies need to change the manner of management, access advanced technologies and improve worker skills to increase manufacturing capacity and enhance product quality and competitiveness. “The government should facilitate and support the linkage between domestic and FDI businesses,” he said. Vietnamese companies, especially small and medium enterprises, need to upgrade their technology management capabilities to meet global standards and join linkages with multinational groups. Koji Ito, President of the Japan Chamber of Commerce and Industry (JCCI) in Vietnam, believes tightening relations between domestic and FDI business is crucial to enabling Vietnam to hold major positions in global supply chains. In his opinion, one of the government’s responsibilities is to create an open and favorable business environment, while at the same time maintaining strict discipline. Specifically, favorable conditions should be created for domestic businesses, with strong start-up spirit, and FDI businesses, with strong financial capacity and management experience, to access resources, such as manpower, products and capital. Richard Leech, Board Member at the British Business Group Vietnam, said although Vietnam had made great progress in improving the investment and business environment, the country still has to resolve various problems to increase cooperation between domestic and FDI businesses to bring their advantages into play. Leech expressed hope that the Vietnamese government would continue cutting administrative procedures and adopt appropriate policies to support the private sector and protect its investment, as well as suitable mechanisms to deal with disputes, and ensure the consistency of the Law on Investment and the Law on Enterprises. He said the British Business Group Vietnam would continue its efforts to contribute to accelerating the ratification of the free trade agreement between Vietnam and the EU and create opportunities for European and Vietnamese businesses and consumers to tighten cooperation. Tomaso Andreatta, Vice Chairman of the European Chamber of Commerce in Vietnam and Co-Chairman of VBF Consortium’s Management Board, said most Vietnamese businesses are small in size and need to improve management skills. In the context of international integration and enforcement of free trade agreements, they should take the initiative in tightening linkages with FDI companies, he added.